One week ago Scarlett found an unopened box, inside was a little blue booty filled with quarters that Chris and I used to use for laundry money, she claimed a silent finders keepers and stowed the money away for herself. Last weekend Scarlett heard me say that we needed to go to the grocery store to get some food for dinner. She grabs her bag of quarters triumphantly and asks if she can use it to help my buy "something good" at the store. I laughed at her willingness to share for the sake of "something good" being added to the dinner table. When we pulled up to the store she saw a tiny helicopter ride, and before I could throw out any arguments against actually climbing or getting 20 feet near that germ infected public monstrosity, she exclaimed "I brought my monies, now I can ride the helicopter". Tuche Scarlett, and ride she did. Tuesday of this week, I receive this picture at work with a text from Chris, "happiest place on Earth". On his way out of the door, two kids and diaper bag in hand Scarlett yelled "wait, I have to get something". She came running back to the car with her booty in hand and smile plastered to her face. 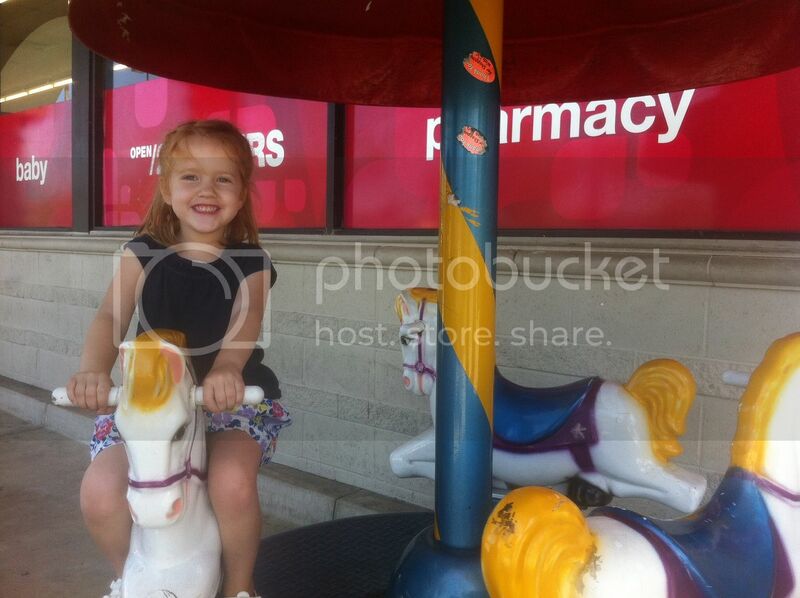 She no longer wanted to spend her money on "good" food for the table, she wanted to ride the carousel. And ride she did. I have a feeling that this new found love of germy outdoor quarter stealers is going to last until that booty is down to its final coin.